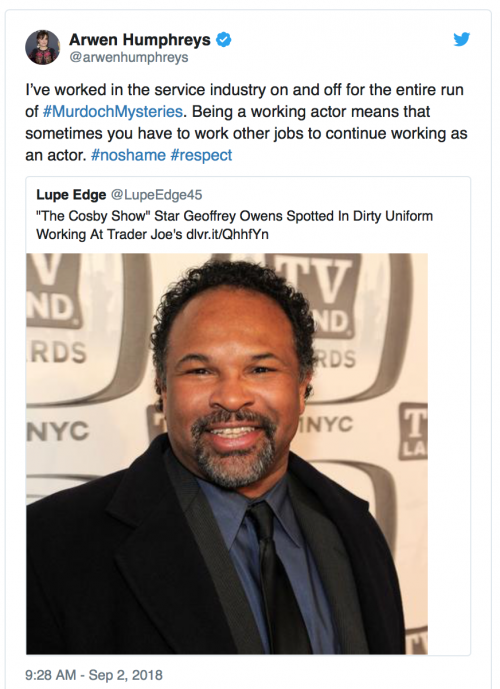 Geoffrey Owens, talented actor and Yale grad: you have my respect and admiration. This August, in between teaching, writing, starting my new design biz (Pen Jar Productions), I too worked in the service industry, running the door at The Rectory Cafe, a beautiful restaurant on Ward’s Island. Part of my job included sweeping the entire patio and filling water bottles before the first ferry load of guests arrived. As always happens, I sat many of my former students (some from last term! ), editors and work colleagues and even a few university classmates (“Alison, is that you? !” they gulped/winced). I’ll do whatever it takes to be in charge of my work life and creative interests. I’m not in to putting things off, and for this the service industry is brilliant and flexible.